The Buck Box. Building the Ultimate Kill Kit for the Run-N-Gun Hunter. I consider myself a “run-and-gun” hunter. By that I mean the kind of hunter who gets out into the deer woods whenever they can, not just when conditions are prime for big buck sightings. I would love to sit around and wait for that 20-degree temperature drop that magically hits right at the rut and on a day I know I can get away into the woods. The reality though is that with a full time job, 3 kids and a life outside of deer season, when that perfect day does arrive there is a better than average chance that I won’t be able to hunt anyhow. So I hunt when I can. When I do get that unexpected time away from day-to-day responsibilities, I don’t want to spend a crazy amount of time rummaging through my house and garage looking for all my gear. 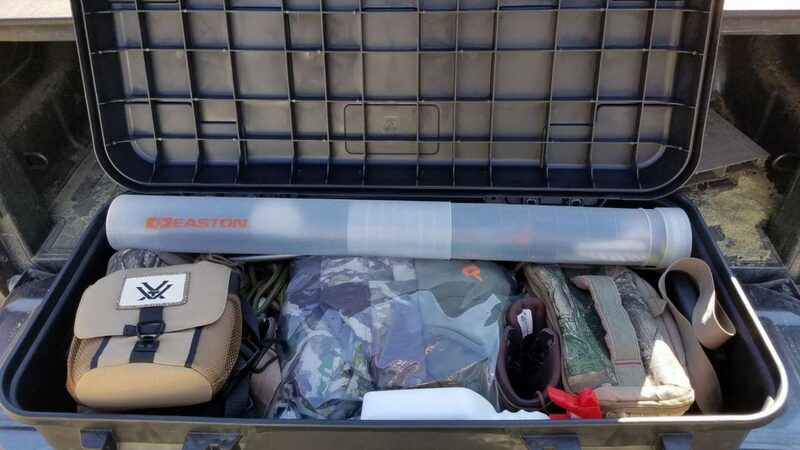 To make sure I am ready to hit the woods at a moment’s notice, I’ve put together what I like to call the “Buck Box.” The Box lives in my truck during the hunting season and contains everything I need to go afield, with the exception of my bow and my portable treestand, the latter of which stays secure under my truck bed cover. That way, if my daughters dance recital is cancelled, or conditions are prime on a day I can call in sick to work (cough cough…) I know I am ready to go. The core of the Buck box is the Plano Sportsman’s Trunk. The trunk is made out of relatively tough and weather resistant plastic and is lightweight, lockable, stackable, has tie down points and is even airline approved. The 108-Quart trunk has interior dimensions of 34.75" X 16" X 13.5" and pretty much holds everything with the exception of my bow. If I can find a trunk that is big enough to carry my bow, but not so big it makes it unruly to take to and from my truck, I’ll pick one up. Until that point, I’ll just make sure to not forget my bow, which shouldn’t be hard to do. In all honesty though, I have forgot my arrows at least once, so it could happen. Small external frame back. Hunting primarily in the Midwest from a treestand, going on a hunt rarely necessities carrying a full pack, but it’s nice to have one available just in case. I chose a military surplus Swedish army backpack and I can’t recommend it enough. Relatively light weight and very strong, the pack has an external steel frame and a capacity of 1,560 cubic inches. It can be had for less than $100 across the internet. Field Bag 1. While the backpack spends most of its time in the box, I never take a step into the woods without this field bag. The bag contains the essentials for almost any hunt I go on, but most importantly it’s the home of my kill kit, a small canvas pouch that contains everything I need to recover an animal after my arrow or bullet has found its mark. Also in the field bag is my range finder, bow wrench and wax, release, gloves, headlamp, bottle of water and snacks. Even with all that, the bag has plenty of room to spare for most anything else that I need to grab for the days hunt. Field Bag 2. Camera Gear. I don’t always film hunts but when I do, I want to be able to locate the camera equipment I need quickly to toss into my primary field bag. In this bag goes a digital camcorder, GoPro and GoPro accessories, camera arm, a couple trail cameras, spare batteries, memory cards, download cables and a beat up old mini laptop that I use for trail camera card dumps. 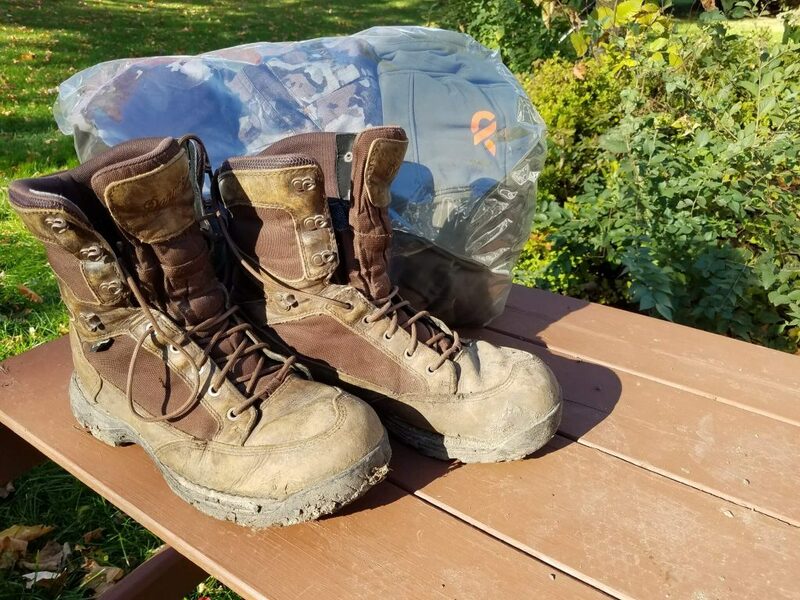 Boots and hunting clothes: Most of the time, I know far enough in advance that I am going on a hunt and have no problem getting my hunting clothes ready. On the rare chance I don’t though, I keep a spare set in a vacuum sealed bag. My First Lite system of base, middle and outer layers pack down nicely. Don’t forget socks. 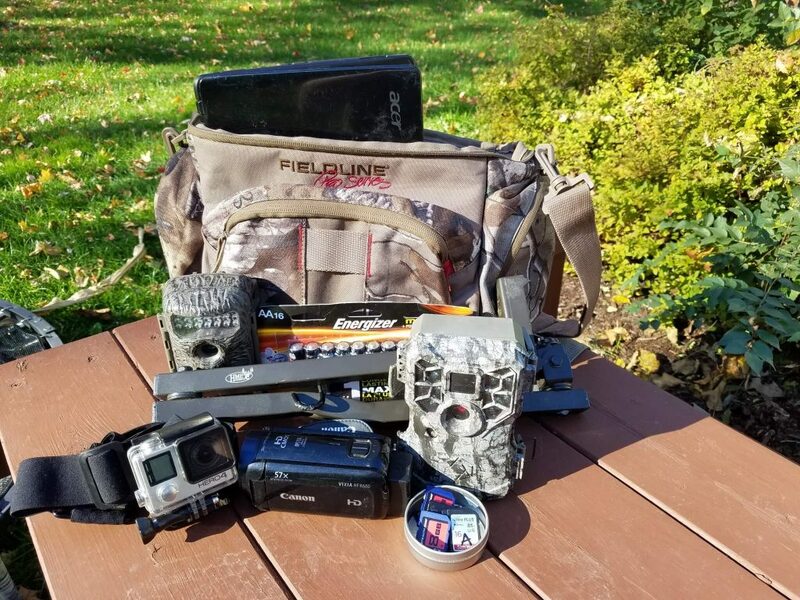 Other Items: Some items that need to go in the Buck Box but don’t fit in a smaller bag includes by Vortex binoculars, tube of arrows, Scent Killer, camera tripod, and 25 feet of rope. There it is. Crazy how you can fit almost a whole season of hunting into a container about the size of a large duffle bag. Consider putting together your own, as the Buck Box has worked really well for me this season, and might just work for you too. Am I missing anything? I’d like to hear your thoughts on hunting essentials that would find their way into your own Buck Box.